Will Quinto Be The New Spock? Heroes star Zachary Quinto (IMDB page) has made it well known that he is interested in being the new Spock, as we reported in May and in Decmeber. However it appears there may be more to the story. TrekMovie.com has heard a few times that there have been some talks between Quinto and the film’s producers, but that no deal is done. It is of course almost impossible to nail anything down with regards to casting so this is just rumor at this point, however it seems that CHUD have been picking up on the same thing. They report Quinto is "in negotiations" to be Trek’s new Vulcan science officer. As we learn more we will bring it to you. Quinto’s work as the villain Sylar on Heroes (where he co-stars with JJ Abrams best friend Greg Grunberg) has been quite impressive and created a buzz about the 30 year old actor. TrekMovie.com has been hearing that the producers are leaning away from ‘big stars’ for the staring roles of Kirk and Spock, and if so then Quinto would be an excellent choice. Hopefully by Comic-Con we will know more. I think it would be interesting to have Quinto in the role of Spock. Hopefully, he understands that there is a long history with the character. Now, just sit back and wait for everyone to start saying why he is abolsutely perfect or utterly wrong for the role. I got hooked on Heroes when I heard rumors he may be cast as Spock. It’s a good show and he looks like he could be a good fit. Quinto? Sure, I can see that. He could be good. I liked his intense portrayal of Sylar on Heroes. Spock would have to be cool and reserved, but I suspect Quinto’s got the acting chops to pull it off. I am all for this guy being cast as Spock. The most important thing in casting Star Trek is casting fine, not just good, but fine or even exceptional actors. Not pretty faces or the hunk of the month or whatever. And it doesn’t matter if they look like the old actors, they need to be able to act. That was a big part of Enterprise’s and to an extent Voyager’s problems. Then again, if you were going to make a Trek movie with the best actors, they should probably have called the DS9 cast up. Ah, a quick google image check and I can now see it. I know nothing about his acting, but he could certainly have the look with the right make up. Maybe the only reason I would bother rushing to see it is with Quinto’s involvement. Otherwise I’ll wait six months for the DVD.Very little of the film has given me much excitement. It would really bolster his career outside of Heroes. He’s definitely got an onscreen intensity. Not all the Vulcan actors have had that. Nimoy, natch and Mark Lenard. Actually, most of the actors who played Vulcans on Enterprise “got it,” with one notable exception who just looked bored for four years. I can see Quinto doing it. It will be interesting to see what any actor does to make the role his own. It can’t just be a strung together collections of Spock-isms. (“My coffee is fascinating.” “I find it highly illogical that you just kicked me in the groin.”) I’d love to see them go the whole movie with as few of those retro moments as possible without altering the soul of the character. Can it be done? We’ll know on Christmas ’08. From what I’ve seen of his acting I am not convinced he could pull it off. Sylar is a fairly off the wall nut job character where Spock is a much more unique character. He may be able to pull it off. Then again he may not even be in it! Sure hope Leonard is though….now there is an actor. Oh come on, they’re not going to cast this movie based on how much the actors look like the original cast. Besides the fact that he would be tremendous I think he does look quite Nimoyish, certainly more so than Adrian Brody or The english actor from Rome with the bad snagled choppers some have mentioned. #19 Well, they should…it’s going to go a long way as far as how much people buy these actors in these roles. Anyway, I don’t know who they SHOULD get for any of these roles. I would say a complete unknown…or near complete unknown. Something akin to the casting of Brandon Routh as Superman…now that was great casting. I think so too, Routh was great–BUT I have just discovered Smallville. I’ve watched all of it on DVD in the past couple of months, halfway through Season 5 now. Tom Welling should have been given the role. He would have been great. Casting is everything. Picture Anthony Hopkins portraying Hannibal Lechter. Great, right? Well, picture any other actor in the part……..not so good, huh? Well, hello producers…..GET IT RIGHT!!!!!! I’m not sold on this guy. I’m not saying he won’t do a fine job,but I just don’t see him in the role. I would think that this is going to be by far the toughest (and maybe most important) role to cast. Good luck to him if he gets the role. Routh was a great choice for Superman. I like Welling, but its harder for me to picture him in the superman suit. I wouldn’t rule him out playing Superman in a movie in the future, though. Wait till Routh has made a few, and move on to Welling after that. You know…something just struck me!!! Suppose this new movie is not…”The first Mission of Kirk,” but the biography of SPOCK!!! Hey, I would watch that! Think of it…Shatner’s Comment in the other post (I haven’t read the 300+ response post, som maybe someone else has come to this conclusion) that he is not in the script. It’s called Star Trek, not Spock Trek. It wouldn’t be Trek without Kirk and Bones. No harm dreaming about a Spock spin-off movie, though. i can see him as Spock – now WTF about Kirk? He looks the part, and seems a good actor, but there’s no telling, from his role as Sylar, how he’d be as the ultra-staid Spock. The fact that he’s not too well-known works in his favor. He’s the perfect choice, but too bad they soured the movie by not including Shatner. I’ve seen this actor in action in other parts and well he’s very versatile in his acting. He definitely looks *more like Nimoy* in those two pic, Snake. They’d have to get the eyebrows right for it to work…but yeah…I can see him as Spock better now. #33. Um yeah, it IS important what these actors look like compared to the originators of the roles. If not me (which I will, because to me the looks influence how much I buy the actors in the roles), the the VAST MAJORITY of the public WILL be judging the film to a large degree by how believeable/recognizable the actors are compared to the originals. Comparisons are going to be made. It’s just inevitable and it’s going to happen, so…I hope the casting director “chooses wisely”. It’s not the looks. It’s how he will interact with the actor who plays Kirk. TOS was all about chemistry. That was the magic. Whoever they choose, they better get some screen tests with the actor playing Kirk and make sure they click before they sign the dotted line. 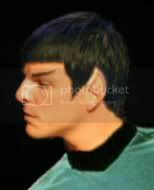 It’s a brave actor, unknown or otherwise that dons the ears, eyebrows, and haircut of Spock, a part so associated with Leonard Nimoy over the years. I just hope that whoever gets the part reminds me of Leonard, if even a little, once on screen, and that he has a good VOICE too. Leonard Nimoy exuded gravitas in the role with his marvellous voice. The vast majority of the public barely remembers what these people looked like in their youths. Spock has to have pointed ears and not be someone you can confuse with Chris Farley – even the eyebrows are optional for recognition, but they will of course do that and the haircut as well. If you Google image search on Nimoy and see some pre-Trek shots of him, the resemblance is even more noticeable. And I disagree that resemblance is unimportant to casting the roles. It may sound somewhat goofy to say so, but in some ways this is akin to casting historic figures. Nobody expects an exact double, and certainly acting ability is far more important, but if you’re casting somebody to play a former president or movie star, you expect some level of recognizability. Same here. And if Quinto does get the nod, it would seem they found a happy match. Exactly so. And to take the example of Abraham Lincoln – probably the most physically distinctive and widely recognized American historical figure – he’s been played successfully by everyone from Hal Holbrook under *heavy* makeup to Henry Fonda without so much as a fake beard. Looks like Quinto already has pointed ears in that Heroes “Parasite” footage. That is a plus. Have to weed eat his eyebrows though. #41 No spechen Deutch here! I’d like to complain about this casting, however I love “Heroes” so, lets just use the whole cast for the newTrek movie. Masa Oki said he’d be up for Sulu. Lets go all the way! Who else from Heroes could we cast as whom? Quinto has been my choice for a while. He’s a very fine actor and given that Spock is easily the hardest to play getting him right is paramount – no pun intended.